Some users like to put movies on USB storage and play movies on Samsung TV via USB port while others choose to upload local video library to NAS then enjoy TV shows, movies, drama shows on Samsung TV over the network. If you have lots of (Blu-ray or DVD) ISO files and a Samsung Smart TV, chances are you want to play ISO files on your Samsung TV via USB or NAS. However, can Samsung Smart TV read ISO files from USB or NAS? You may have this question. Can Samsung TV Read ISO Files from USB or NAS? Generally, most LED/LCD/3D Smart TV can't read ISO files from USB or NAS, Samsung is not an exception. So what's the best way to play ISO image files on Samsung TV through USB and NAS? In fact, you don't need to worry. 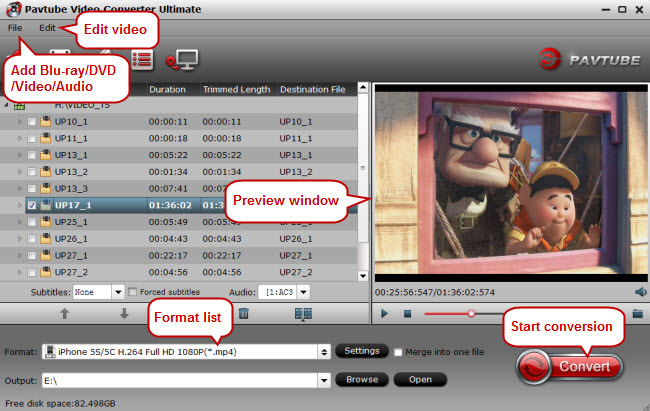 Here we recommend Pavtube Video Converter Ultimate (Mac Version). As the top-rated video convert program, it can easily convert ISO files to any Samsung TV Media Player readable file formats. Besides ISO, it also can directly rip Blu-ray to Samsung TV and copy DVD to Samsung TV. It is capable of allowing users to adjust the output video codec, bitrate, frame rate, resolution or audio codec, bit rate, sample rate or channels to get better output playback effects for Samsung TV. If you have no idea how to change those settings by yourself, you can also use our program to directly output Samsung TV preset profile formats with the optimal playback settings. More important, this program can effortlessly transcode 3D ISO files to Side-by-side 3D MP4 videos, which can accepted by Samsung 3D TV from USB or NAS drive with vivid 3D effect. Now you can free download this best ISO file to Samsung TV converter, it will help you to play ISO files in compatible format on Samsung TV via USB or NAS. How to Convert ISO Files for Playing on Samsung TV Media Player via USB or NAS? Launch the program on your computer, click "File" > "Load IFO/ISO" to browse ISO files stored on your local computer drive into the program. Now click the Format icon to reveal output panel. And mouse cursor to "TVs" category to Select Samsung TV as the output format. The optimized output format will contains the best video settings for playback on your Samsung TV. 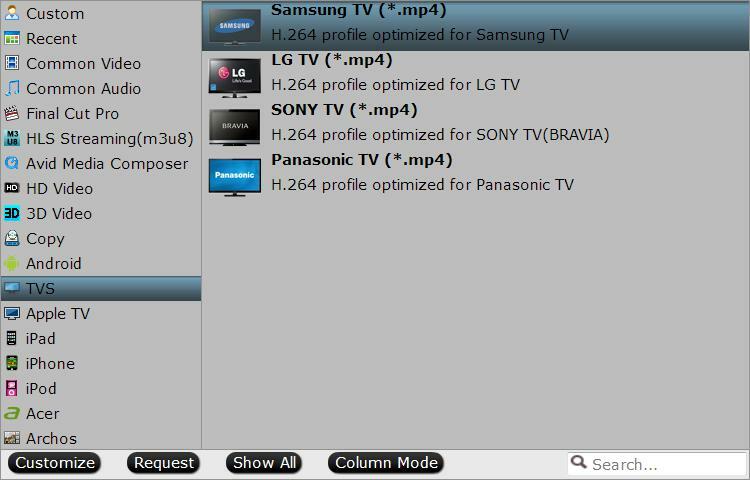 Tip: Before convert ISO files to Samsung TV, you can customize the output parameters by clicking “Settings” button, adjust resolution or bitrate as you need. To convert DVD ISO file, you can choose 1280*720 (720P), for Blu-ray ISO files, you can choose 1920*1080 (1080p). Set bitrate as 3000-6000 is appropriate. Click "Convert" button to start. This ISO converter will convert DVD or Blu-ray ISO image files at a fast speed, video and audio synchronization is guaranteed. When the ISO format conversion finished, you can copy converted videos to USB or NAS and then play movies on Samsung smart TV, you won’t encounter any playback problems. Now please take a free try, hope this tutorial can help you!